I hope everyone reading this had a stress-free, relaxing Labor Day! I ran into the supermarket today, and while I am grateful it was open for what I wanted, the truth is that it could have waited and I felt bad for the people working. We woke up this morning and I made some blueberry vanilla almond flour pancakes. I love love love using almond flour and sometimes an almond/coconut flour combo instead of packaged gluten free pancake mix! The recipe I use is just so simple!! You can add in whatever you like!! 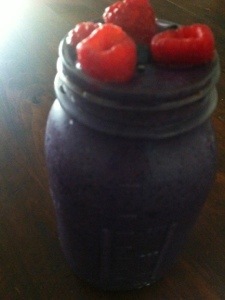 I added 1 tsp vanilla powder and a big handful of organic blueberries. I cook mine in a cast iron skillet over medium heat. They do take longer than regular pancakes- maybe 3-5 min per side. I like to top mine with coconut oil, real maple syrup and more fresh berries! After such a delicious but heavy breakfast we played outside with Amethyst in her sand box and did some more tidying. For lunch I wanted a salad!! I made this and it was sooo good! 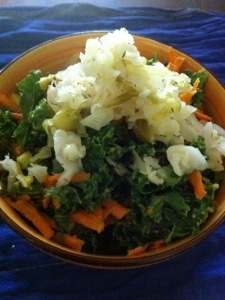 Farmers Market kale massaged with avocado and lemon juice, with grated carrot, chopped apple and spring onions all seasoned with sea salt and pepper and topped with homemade Dill Kraut! So perfect! Amethyst didn’t really eat much salad so I made a big smoothie that we all shared with banana, avocado, frozen blueberry, cacao beans, dates and almond milk topped with fresh berries. 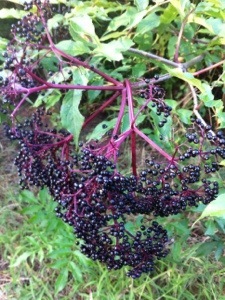 We went for a drive and met this Elder who let us take some of her berries! We are going to tincture our haul this time and have some wonderful immune support this winter! We were so pleased as we hadn’t been able recently to get to know a lot of Louisiana flora. Glad to know that Elder lives here too!! After that I was hungry and tired so I stopped into the stupormarket where I bought pineapple and some purple corn on the cob (so surprised to see this) which we had for dinner! I had my corn with coconut oil and black pepper. Delicious and satisfying! !